In Translation Sites, leading theorist Sherry Simon shows how the processes and effects of translation pervade contemporary life. This field guide is an invitation to explore hotels, markets, museums, checkpoints, gardens, bridges, towers and streets as sites of translation. These are spaces whose meanings are shaped by language traffic and by a clash of memories. Touching on a host of issues from migration to the future of Indigenous cultures, from the politics of architecture to contemporary metrolingualism, Translation Sites powerfully illuminates issues of public interest. Abundantly illustrated, the guidebook creates new connections between translation studies and memory studies, urban geography, architecture and history. This ground-breaking book is both an engaging read for a wide-ranging audience and an important text in broadening the scope of translation studies. "A novel genre - a translation "guidebook" - part travelogue, part diary, part meditation on sites of memory, this poignant study uses translation as a medium to communicate the affective charge of linguistic encounters and political conflicts past and present. Hotels, markets, churches, museums, checkpoints, gardens, bridges and streets - each location is mobilized as a zone of polyphonic expression and cultural difference. A must-read for those interested in translation, urbanism and cartographies of memory." 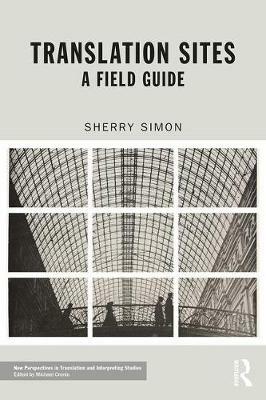 "In her very compelling volume, Sherry Simon guides us through a fascinating range of sites where different forms of translation speak in both an unsettling and emotionally inspiring manner. The book listens patiently to voices ranging from writers and artists to Holocaust survivors and political activists. Simon thus strikingly extends the frontiers of translation, investigating questions of diversity and accommodation, identity and community."